English 1750 period Grandfather Clock in antique mahogany and Brass components. Elaborately crafted classic english style grandfather clock with bell chime: Case in mahogany with crotch mahogany veneer and maple inlays, 2 doors, beveled crystal glass, handpainted, original Black Forest dial with fine rose ornaments, polished 16,5 cm second pendulum. 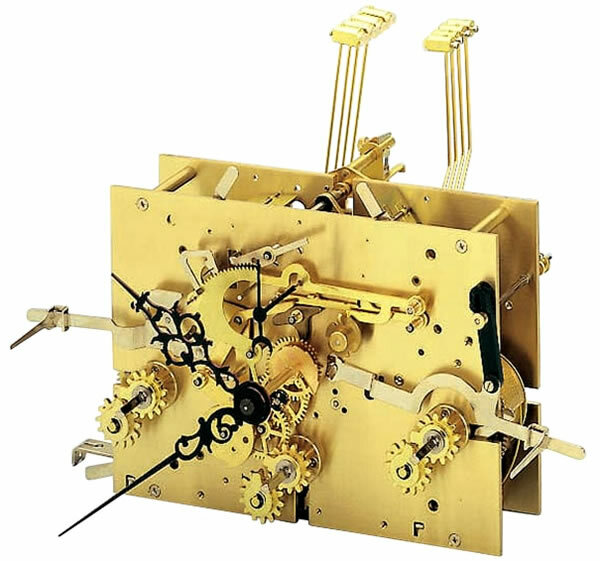 KS 1/4 cable movement, Westminster chime on 8-rod gong. Kieninger KS 1/4 cable movement plays the Westminster chime on 8-rod gong. Levers on the dial control the hour chimes and the melody - You can select Silent, Night Silent between 22.00 and 17.15. or Continuous. Movement servicing requirements. A lubrication every five years and a clean at ten yearly intervals will ensure excellent reliability and an extremely long life! You will find a BHI recommended clock service business by opening the Menu Link to Kieninger Manuals and Interesting Links. Click here to view the Kieninger 0105-31-01 Options and Prices page.